Did you know that jackfruit, the largest fruit from a tree, belongs in the same family as figs ? Well I did not. Figs have thin edible skin and fits in the palm of your hand while jackfruit is usually as heavy as toddler and has spiky thick skin. Both have large fan following, and I for one happen to like both , same family or not ! Jackfruit is native to India and Srilanka. As many other tropical trees it grows very tall easily reaching 60 to 80 feet. It is very popular in the southern Indian states, especially so in Kerala and Tamilnadu. We call it chakka in Kerala, and pretty much every family had access to one jack tree and its fruits. The fruits could weigh upwards of 40lbs. Harvesting the ripe fruit from tall trees unharmed, was a feat to be accomplished. The mature but not yet sweet jackfruit petals are perfect fried and the ripe fruit is usually eaten raw or used to make preserves and sweets. The tender jackfruit has meaty texture and can be used in a variety of dishes as meat substitute. Substitute it for the meat in a spicy curries like my Varutharacha chicken Curry or in meat cutlets or as in this instance a meat alternative in biryani. 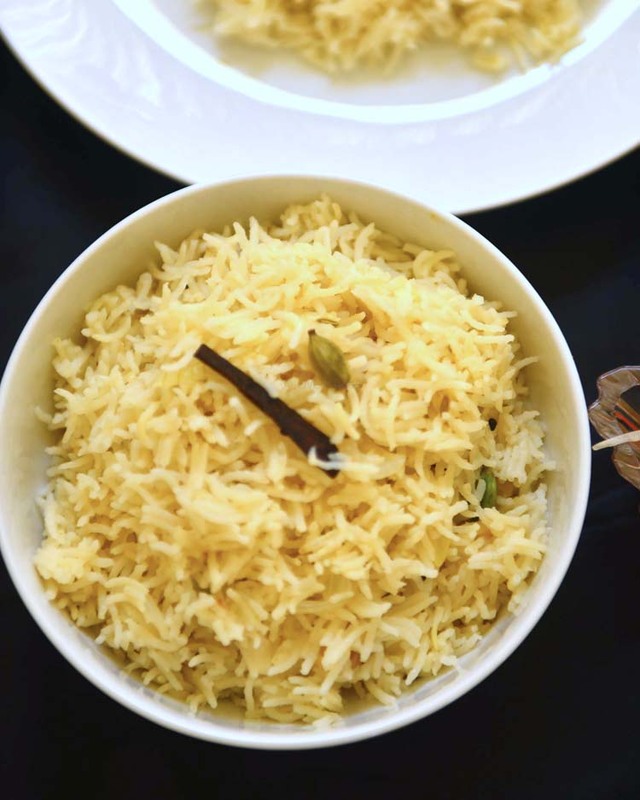 In case you didn’t know biryani is a one pot dish with layers of rice and meat (or vegetables) baked to perfection. 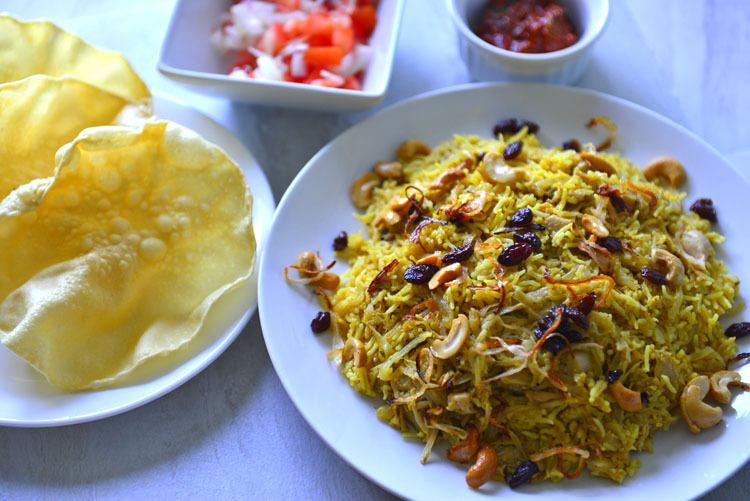 The traditional method of making biryani is elaborate and takes a lot of time. By using a pressure cooker, electric or stove top, the cooking time is dramatically reduced, plus everything happens in just one pot . 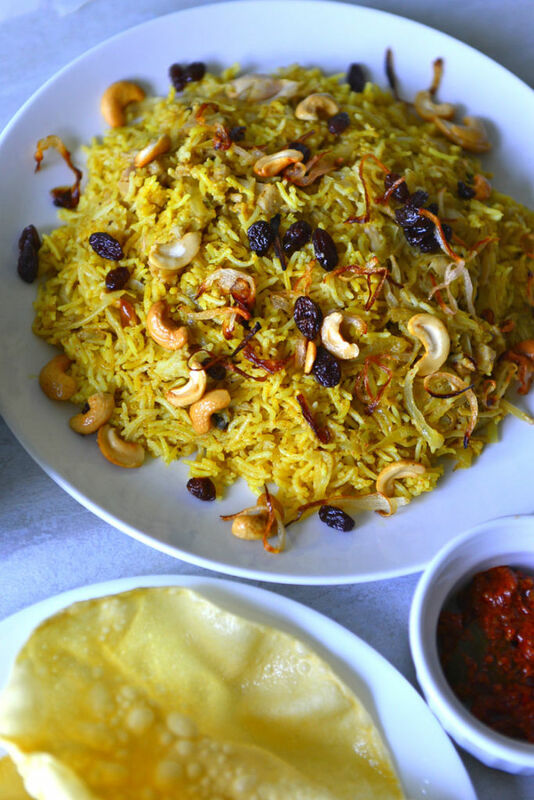 Part of the exotic flavors of a biryani comes from the fried onions, fruits and nuts. Some of this is used between the layers while the rest is used to garnish. I can not imagine making biryani without these, but feel free to reduce the amount or skip these altogether. About frying onions – it is not fun. The onions tend to absorb oil and frankly it is an extra step that takes up time. A trick I use is to dry them a little first. Slice the onions as the first step of the prep work. 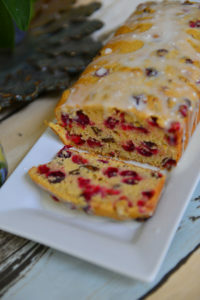 Spread on a sheet pan. Place the pan in the oven and set the oven to 200° F and let it stay for about 20 minutes while you continue with the rest of the prep work. Alternately on a hot day, leave the sheet pan out in the sun (under a net of course). A little bit of drying definitely saves time and reduces the amount of oil needed. The fried onions can be refrigerated or frozen as well. A word of caution if using fresh jackfruit– the milky sap of the fruit is very sticky. Apply oil liberally on the hands and the knife to prevent it from sticking everywhere. Cut off the green skin and slice the white flesh into about 2 ” pieces. Boil the pieces in salted water for a few minutes until it is partially cooked and reserve. As far as the canned version goes just drain and rinse under water before using. Here it is on pictures .. Some cooks fry the jackfruit chunks before adding to the dish, but I find that lightly crushing the pieces before marinating in spices is more than enough to enhance the taste and texture. 10 minutes or so of marinating is more than enough to bring out the flavors. An easy vegan one pot meal in under an hour. Thinly slice the onions and place in a 200° F oven for 10 to 20 minutes (optional) while the rest of the ingredients are getting ready. Rinse the rice under colder water and soak in plenty of water. Set aside for at least 10 minutes. Drain the Jack fruit pieces from the can and rinse under cold water. Crush the pieces lightly using the back of a kitchen knife or pestle. 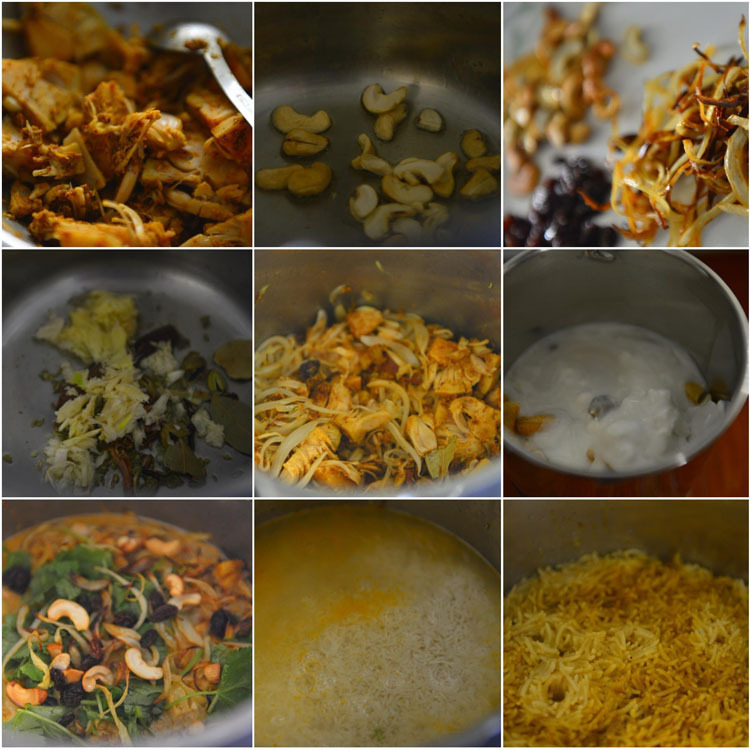 Mix all the ingredients for the jack fruit marinate together into a paste. Apply the marinate on the jack fruit pieces and set aside. 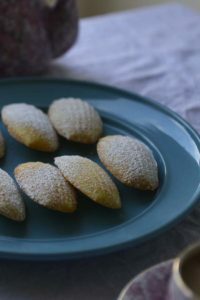 Grind the cashew nuts along with the coconut cream to a smooth paste. Add 1 to 2 tbsp water from the reserved water if needed. Mix the paste with the remaining water and set aside. Heat 2 Tbsp oil in the pressure cooker. Fry the cashewnut halves until brown. Drain and set aside. Add the raisins to the oil and fry till it plumps up . Drain and set aside. Fry a handful of onions till golden brown . Drain and set aside. Add 1 to 2 tbsp more oil to the pan if needed. Add the whole spices , crushed ginger and garlic and the remaining onions to the hot oil. Cook for a minute and add the marinated jack fruit pieces. Increase the heat and let it cook for a minute till the piece begin to turn light brown. Add the cashew nut paste. Stir well. Add the chopped coriander and mint leaves. Add half the fried onions , cashew nuts and raisins on top. Scatter the drained rice on top. Level the rice using the back of a spoon. Pour hot water on top. Taste the water and adjust salt - it should be very lightly salted. Place the lid on and cook for 1 whistle (Rice Setting). Let the pressure release naturally . 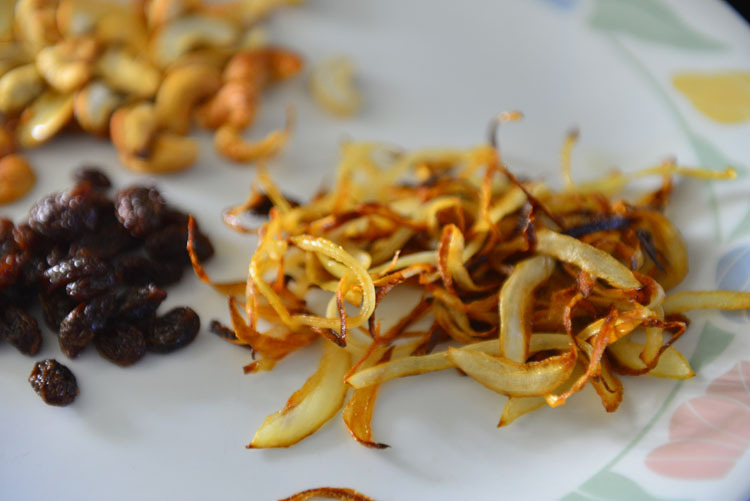 Uncover , mix lightly , transfer to a serving plate , garnish with the remaining fried onions , nuts and raisins and serve ! 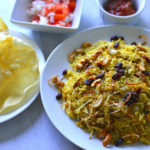 Usually biryanis in Kerala are served with raita ( salad vegetables mixed with yogurt and herbs herbs), a spicy pickles and a few crunchy pappadams. If you are not a fan a pressure cooker – here is the standard version. Cook the jack fruit as in the recipe in a thick bottomed pan. Cook the rice about half way through in plenty of water with the whole spices. Drain and layer as in the recipe. Do not add any more water. Cover and bake in a 350°F (175°C) oven for 30 minutes. If stove top method is preferred, use a thick bottomed pan with sturdy lid. After layering the rice, cover tightly so that no steam escapes. Place the pan on low heat and cook for 20 to 30 minutes. If possible place a heat source on the lid like a heated griddle or few hot coals in a bowl.